Just like his book, ‘One Second After’ Mr. Forstchen has the ability to put the reader directly into the very real scenarios that he describes. In ‘Day of Wrath’ William R. Forstchen again dares to think the unthinkable by imagining the effects of a series of coordinated attacks on the American heartland by ISIS, the savage Islamist terrorist organization currently sweeping across SYRIA and Iraq – with its sights set on a Middle Eastern Caliphate ruled by Sharia Law. ISIS has also threatened to bring their brand of savagery to America, and this is what the author lays out for us – depicting the brutality of one eight hour period. It’s frighteningly real and the reader can easily put him/herself directly into the story. Both of his books are must reads for Americans, especially those who don’t believe that our country is vulnerable to attacks. 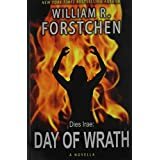 This entry was posted in Book Reviews and tagged Day of Wrath, Day of Wrath Review, One Second After, William R. Forstchen on November 12, 2014 by GunGuy.